One thing was clear on a second look at this match...it was an enthralling one to watch. The lead changed hands a few times, and could easily have done a few times more. There weren’t too many world class overall performances, but there were definitely some fine moments throughout the match. But most of all it was a contest played with a lot of heart from all involved...the combined total of 300 tackles tells its own story. We must not forget where the two sides were form-wise as the match kicked off. The Welsh had already suffered two disappointments in this campaign and were keen not to have a third in front of their ever-vocal fans. Ireland had a disappointing start in Murrayfield from which they couldn’t quite recover but since have found some form and were rightly considered favourites, if not by much. And for the first fifteen minutes, we played like favourites. But I have a feeling that what gave us that strength in those opening phases ended up being our biggest weakness overall. Many criticise Joe Schmidt for his selections, and that certainly can always be debated, but there is no way anyone can suggest he doesn’t have his matchday squad well prepared. Whether we take or receive the kick off, you can see what we are trying to do and watching the fifteen players perform their tasks can often be a joy to watch. Here’s where I feel the problem lies...the patterns may be well-devised and the preparation may be flawless, but even without the system’s risk-vs-reward demand for accuracy, I really believe this Ireland setup is left extremely vulnerable when the actual match conditions aren’t perfect for our plans and it has cost us dearly on several occasions over the past few years. I reckon if you look at the bulk of our defeats in that time...against England and Wales that denied us Grand Slams, those gut-wrenching ones against New Zealand in 2013 and Argentina in 2015, the 2nd & 3rd tests in South Africa, Paris last year and recently in Edinburgh...you can make a case that all were winnable. But let’s go back from the general to specifically Friday night in Cardiff. Like I said, we had a good start and everything was ticking over nicely enough. We earned a 3-0 lead, we had a nice thing going on Welsh possession as we were picking off Dan Biggar passes for fun, and when CJ Stander surged up the touchline before we won a penalty it looked to all intents and purposes like we had the upper hand. Many would say we should have “taken the three” at that point...personally I didn’t have too many problems with going for the corner at that stage. But the second Rory Best let go of that dart I think we started to let go of our control. Please don’t get me wrong...all the blame isn’t on him for that or any other lineout...there are far too many factors involved in the setpiece. My point here is that I think we sometimes get so caught up in our self belief that we forget (maybe too strong a word but I’m struggling for another one…) our opposition is actually, well, an opposition? Alun-Wyn Jones knew exactly where to stand, he knew exactly when to jump, and with one swat of his hand he left our plan to stretch our lead in tatters. Because that’s what quality players like him tend to do. But here’s the crucial point...when we were stealing those passes from Dan Biggar, the Welsh played on and sometimes even won it back. When our plans were disrupted, we looked rattled; there was of course more rattling to come, and on a much grander scale. When I see either Conor Murray or Johnny Sexton receiving attention, I let out a sigh, but it’s not because I have absolutely no faith in the likes of Kieran Marmion or Paddy Jackson. Nor do I think Joe Schmidt & co lack belief in those players. But the starters are such a world-class pairing that when you prepare for a big match with them, it’s hard not to pin the bulk of your hopes on getting at least 70 minutes out of each. And from the 19th minute to the final whistle, they were either separated on the pitch or one of them was below 100% and while we did make adjustments that brought some success, it simply wasn’t enough. It all started with yet another bang on the head for Sexton. Nothing close to the Bastareaud incidents this time, but the accidental contact with Jonathan Davies’ thigh certainly warranted a head injury assessment. Now I’m going to give the Irish team the benefit of the doubt for what happened after the next lineout. They had to know the ball was going to be sent down Paddy Jackson’s channel. That’s not because he can’t defend...but he was just on the pitch and it was a tight contest where even the tiniest advantage needed exploiting. And boy, did the Welsh exploit it. That first North try was a perfect storm, and it needed to be because if one pass was even a fraction of a second off, the Irish cover would have at least stopped it short of the line, perhaps even preventing a try in the follow up. First we had the exchange from Webb to Scott Williams which took Jackson out of the picture. Then the Ulsterman would have been blocking the view of Henshaw and O’Brien behind him; that made them a tiny second late in reacting to Williams, who was able to return it to his scrum half having added Rory Best to the list of tacklers who missed their mark. Now in open space, Webb fires an absolute gem of a pass towards the tramlines where it fell perfectly into the stride of Leigh Halfpenny, who shipped it on to George North. The winger is plenty big and strong enough to take it from there, even with three trying to stop him, but I’m pretty sure he had all the recent negative press in his head helping him to an exquisite finish. Screw the green goggles...that was a top notch try. But hang on...the score is only 5-3! This match is far from over! And one thing Ireland does consistently well and that’s react to a score...we won back the restart and exerted enough pressure to force an (albeit harsh on Tipuric) kickable penalty ourselves. Jackson kicked the points, and not only did we now have the lead back, we also had our starting out half on the pitch once more. Time to get ourselves back to the plan, right? Eh, how about no. 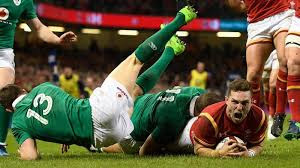 Still, we’re doing well at this stage both keeping the Welsh out (little consolation I know but they never scored a try on us after a first phase) but we were still making little niggly errors like a straight drop by Tadhg Furlong. Then with a penalty advantage coming, Biggar sends a neat crossfield kick to Halfpenny, who has Davies in support and initially he is well stopped by Sexton but the outhalf doesn’t roll away and probably deserved the yellow card that followed. Halfpenny kicked the penalty and the halftime score was 8-6 to the hosts. Somehow we had to see out the spell after the break without Sexton. Did this play into the decision to risk Murray to start the half? His arm didn’t seem too much better after the spell in the dressing room, yet start he did. That said, we seemed to start in pretty good nick...putting together 14 phases in Welsh territory. We didn’t seem to be getting too far but at that stage, we didn’t really have to, we just had to kill some clock and not make any more mistakes. Yeah, about that mistakes thing. Sean O’Brien threw a pass behind Jamie Heaslip, it went to ground, Wales were ready to pounce, they kicked it deep into our 22. Of all the defenders to be on hand to deal with the dangerous situation it had to be Conor Murray, didn’t it. He got bundled into touch which both put the home side in an ideal attacking position with the extra man and it pretty much finished his arm. So the Munster scrum half ended up going off, but not after the Welsh stretched their lead to nine points with another well-executed lineout drill that ended in North grabbing his second try of the night. We then handled a similar pressure situation very well thanks to Henshaw and Zebo and once down the other end we hit the home side for an energy-sapping 26 phases that included a strong break from Donncha Ryan that got us to the goal line. Finally an unfortunate high tackle by Biggar on Ringrose got us a penalty that brought us within six. That score was nearly cancelled out when an attempted Dan Biggar drop goal hit the post, but luckily for us his team-mates were slow to react so we were able to deal with it. Then we had further lineout woes after we made the curious decision of bringing on Henderson for Toner as Wales brought on Charteris for Ball, just as Best had a dart to throw, which he duly did in Henderson’s direction only for it to be pilfered by Charteris. But even then, we weren’t done. From the start of the final quarter we finally began to take some steps to counter the stubborn home defence. And what’s more, it was working. Crossfield kicks, grubbers through towards the 22, even at one stage what I call an “organic maul” (one created in open play as opposed to a lineout). The Welsh were pretty much there for the taking as Halfpenny was bundled into touch. Then we actually won a key lineout, setting up a more conventional maul which was heading for the line. What happened next was technically a mistake from Robbie Henshaw, but I really don;t have the heart to fault him for it. He showed good initiative getting involved in helping his skipper get over the line, he just didn’t quite do it right. I can’t fault Barnes there either, he just called what he saw. But the Welsh can certainly count themselves lucky. We tried some more crossfield kicks after that - maybe if that was the plan we could have had Tommy Bowe on the park? Coulda, shoulda, woulda. Finally as Sexton tried to dink a ball over a blitzing Welsh defence it was blocked by Faletau for Jamie Roberts to retrieve and score...there is no doubt that the home side got a lot more out of their bench than we did, that is another area where we need to be more match-flexible. As for our problems as I see them, I wish I knew the answer. I certainly don’t think too many personnel changes are in order - I thought Keith Earls was our best performer overall on the night, while on the negative side it wasn’t a good outing for the likes of Zebo, O’Brien and Heaslip. But like I said, I think it’s our mindset that needs work as opposed to our selections, if indeed that can be done. If there was a simple way of “turning down” our reliance on the work done in Carton House and “turning up” or ability to deal with what we face on the pitch, I’d be all for it. But it’s not something we need to fix right away, as our next big away test with a full squad probably won’t be until the 2018 Six Nations, either in Paris or London no less. So a deserved win for Wales for sure, though they were definitely not 13 points better than us on the night, as if that could serve as consolation. Now we only have pride left to play for in this year’s Six Nations, but with a Grand Slam and world record on the line for our chariot-swinging neighbours, that pride is worth quite a lot.